For our fourth annual fall tour, we will be featuring five bands handpicked by the AP staff, heading out on a 32-day trek that kicks off mid-October till the end of November. 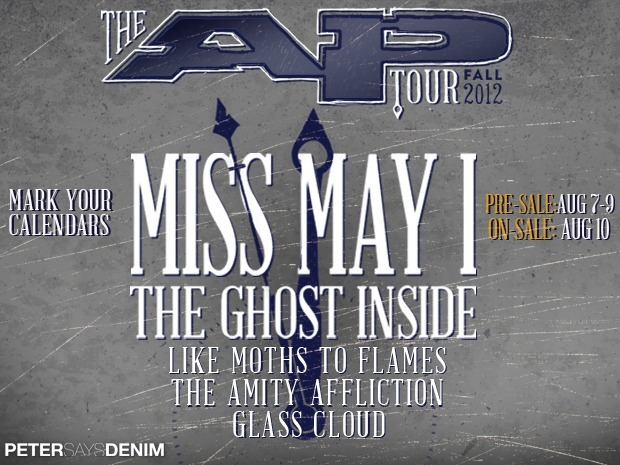 MISS MAY I will headline with main support from California heavy hitters THE GHOST INSIDE. Melodic metal act LIKE MOTHS TO FLAMES, Australia’s modern metal quintet THE AMITY AFFLICTION and technical metal up-and-comers GLASS CLOUD will round out the lineup. Presale purchasers will be given the first opportunity to buy limited VIP packages. With the purchase of a ticket and an additional $17, fans will receive a one-year subscription to AP and all three covers of the AP Tour Fall 2012 issue. In addition, AP is offering a limited VIP Package with the purchase of a ticket and an additional $48. This package includes all three covers of the AP Tour issue, a one-year subscription to AP, access to a meet & greet with Miss May I, a sit-in on Miss May I’s soundcheck, a signed copy of Miss May I's new record At Heart, a VIP laminate and an AP Tour USB with exclusive MP3s, videos and additional content from all your favorite AP Tour bands. Don't miss out on this first-come-first served opportunity before they sell out! The AP Tour is sponsored by Petersaysdemin and ticket pre-sales will be from August 7 to August 9 here. General sales will begin August 10 at 10 a.m. local venue time.